25 Years of Pre-Dawn Car Trips, Mind-Blowing Encounters, and Inspiriting Conversations with a Man of Wisdom. 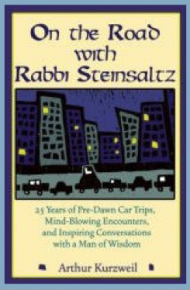 Grab your overcoat and come along for a ride with Rabbi Steinsaltz and Arthur Kurzweil—a ride that could very well change your life. 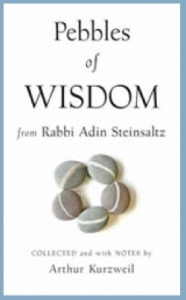 Pebbles of Wisdom includes Rabbi Steinsaltz’s thoughts on the big topics of life including the meaning of happiness, the search for the purpose of one’s life, the point of suffering, discovering oneself, dangers along the spiritual path, the process of transforming oneself, and the challenges of faith. Curious about Kabbalah? This friendly, plain-English guide clears up the common misconceptions about this mystical tradition, showing you how to incorporate its wisdom into your daily life. You’ll explore the history of Kabbalah and its major texts, understand the mystical tree of life, examine Kabbalah controversies and conflicts, and see how Kabbalists grow closer to God. 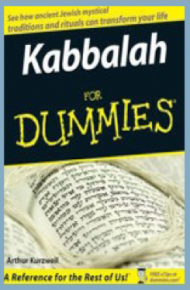 An easy-to-understand introduction to Judaism’s most sacred text. This accessible guide explains the Torah in clear language, even to those who were not raised in the Jewish religious tradition. 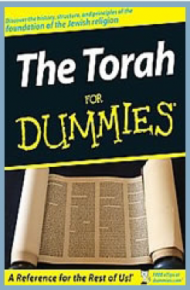 The Torah For Dummies explains the history of the Torah, its structure and major principles, and how the Torah affects the daily lives of people who follow the Jewish way of life. 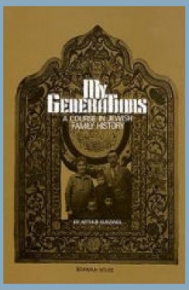 Since it was first published in 1980, From Generation to Generation has inspired thousands to pursue the unique challenges and rewards of Jewish genealogy. Far more engaging than a mere how-to reference guide, this landmark book is also part detective story and part spiritual quest. As Arthur Kurzweil takes you along on his own fascinating journey through his family’s past, you’ll learn about the tools, techniques, and the step-by-step process of Jewish genealogical research —including the most current information on using the Internet and the newly accessible archives of Eastern Europe and the former Soviet Union. But even more, after reading this fully updated, revised, and beloved classic, you will undoubtedly be inspired to embark on a genealogical quest of your own! 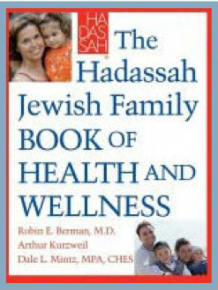 The Jewish people have special concerns, approaches, and attitudes about health and wellness, due in part to certain illnesses known as “Jewish genetic diseases,” such as Tay-Sachs, Niemann-Pick, Gaucher, and others. Beyond these genetic diseases, however, the entire range of topics and issues related to health and wellness has long been of great interest to the religious and secular Jewish community. Jewish tradition has developed many special approaches to health and health-related issues, based on the hallowed traditions and precepts found in the Torah, its commentaries, and the vast literature written by rabbinic authorities throughout the centuries. 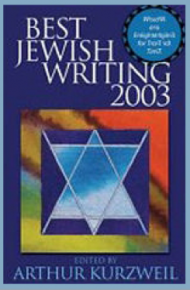 Similarly Jewish secular culture has developed many special attitudes and approaches to the issues in this book regarding women’s health, nutrition, raising children, caregiving, and other special issues. With these words, genealogist Arthur Kurzweil introduces the first course of its kind for the religious school: a text, workbook, and time capsule in one package. Students make the book their own by pasting in family photos, favorite recipes, and treasured family stories. There’s a place for everything, and the result is a unique chapter of Jewish history for students and their families. On Being Free is a collection of illuminating essays written by one of the leading rabbis of the twentieth century. In this new volume Rabbi Adin Steinsaltz explores such topics as the fate of the Jewish people, the causes of assimilation, sin and atonement, and mysticism. He also devotes a section of the book to a study of the five Megillot of the Bible, drawing out the messages these Megillot contain for the modern Jew. 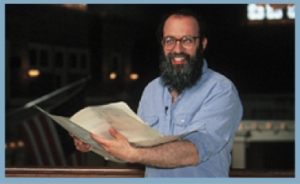 The reader also has the unique opportunity of listening in on two candid conversations in which Rabbi Steinsaltz highlights the role of divine revelation in Judaism, unravels the secret of the tenacity of the Jewish religion, and discusses the steps man must take in order to truly “hear” God. 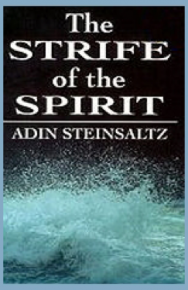 Those familiar with the work of Adin Steinsaltz will once again be delighted to find that many of his essays that have formerly been published in a variety of sources – as well as many unpublished works – are now together in one volume. Readers will encounter in this book a master teacher who, while deeply rooted in the most traditional form of Judaism, is extremely effective at shedding light on the meaning of Jewish existence for the newcomer. On Being Free serves as an important forum for one of the great Jewish teachers of our time. 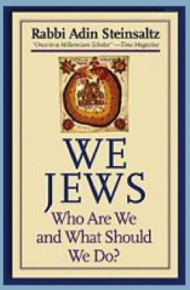 In We Jews, Rabbi Steinsaltz explores the most important issues that concern Jews today as Jews. He provides wise and uplifting answers to Jews everywhere, whether they are secular and assimilated or orthodox–Are we a nation or a religion? Are the stereotypes of Jews really true? Why are Jews so controversial? How can we navigate the opposing forces of diversity, culture, and politics? Can we survive intermarriage and the loss of tradition? Do we still worship the Golden Calf? 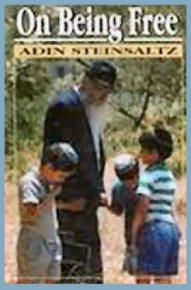 In this book, Rabbi Steinsaltz sees causes and consequences, achievements and failures, looks at the contemporary world, and observes the dreams and longings of modern Jewish people. Written as an intimate and inspiring internal memo to the whole Jewish family, We Jews answers these questions and many more in a way that is at once insightful and inspiring. Finally, a do-it-yourself, how-to-trace your Jewish roots video! Renowned Jewish genealogist Arthur Kurzweil takes us on location to Ellis Island and other significant sites, and shows us how easy it is to look for your origins. 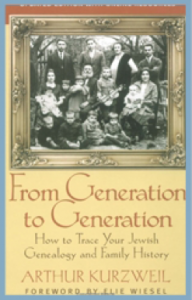 Using his own experience in tracing his family history, Mr. Kurzweil guides us step by step through the fascinating and exciting process of researching, acquiring and examining relevant records and historical documents that will culminate in the fulfillment of many an amateur genealogist’s dream! A perfect gift!